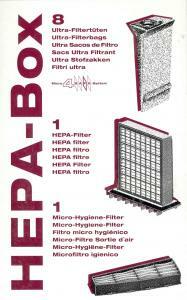 SEBO C-series HEPA Service box contains 8 bags, 1 HEPA filter, and 1 Micro-hygiene filter. - Fits C1, C2, and C3 series canister vacuums. SEBO C-series HEPA Service box contains 8 bags, 1 HEPA filter, and 1 Micro-hygiene filter. Fits C1, C2, and C3 series canister vacuums.